White All Clover . . . Continuing the white theme into November, the most common white wildflower of all may very well be the White Clover, Trifolium repens, which has reappeared in New York City’s parks now that the late season lawns are being mowed less frequently. 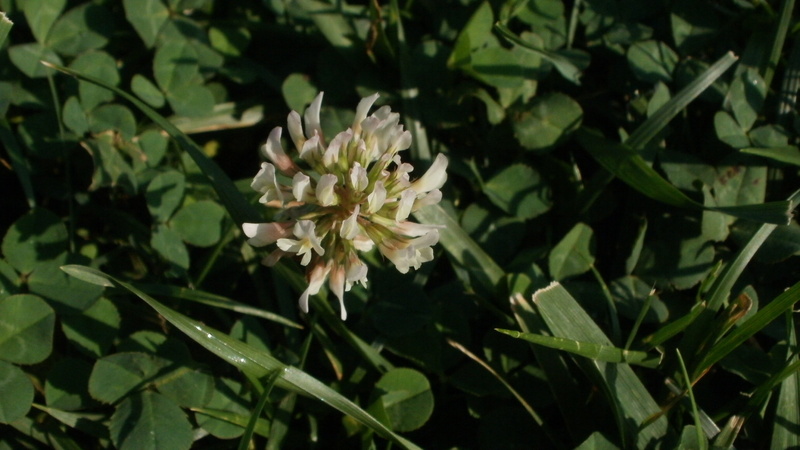 The White Clover, source of the lucky shamrock, is a perennial immigrant from Europe. Unlike most species of foreign origin, this one arrived on purpose as a pasture crop. A book published in 1993 by Yale University Press illustrates one of the silver lining benefits of this now frowned upon horticultural practice. In Redesigning the American Lawn by F. Herbert Bormann, Diana Balmori, and Gordon T. Beballe, two types of lawn are described: the Industrial Lawn, a monocrop of grass like that found on a golf course or ball field; and the Freedom Lawn, an organic, free-range mix of low green plants, including grasses, plantain, and White Clover. Freedom Lawns can remain green even in marginal soil conditions and require little or no chemical fertilizer. The chief reason is clover, being a legume, can fix nitrogen, a major nutrient, into the soil in which it grows. The White Clover sports an attractive bloom. Each flower head consists of twenty to forty florets that give the familiar cotton ball shape that attracts honeybees and human picnickers on balmy afternoons. The leaves below are trifoliate, and each one possesses a pale triangular mark called a chevron. 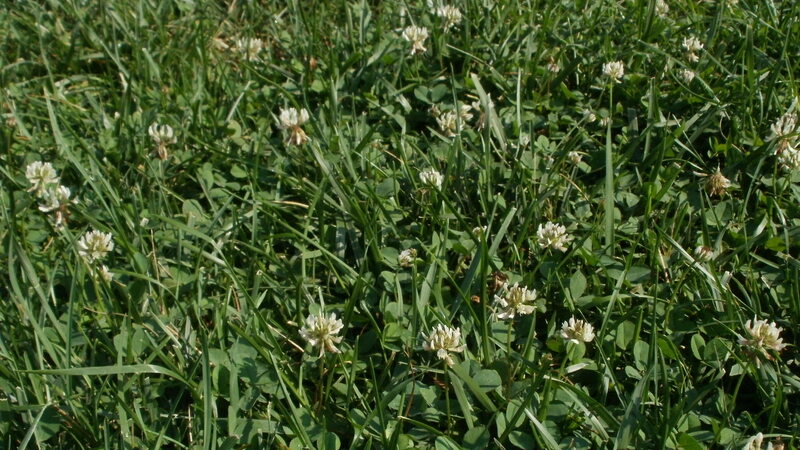 Clover plants spread throughout a lawn on subsurface creeping runners, creating the appearance of scattered white wildflower colonies on the cultivated green. 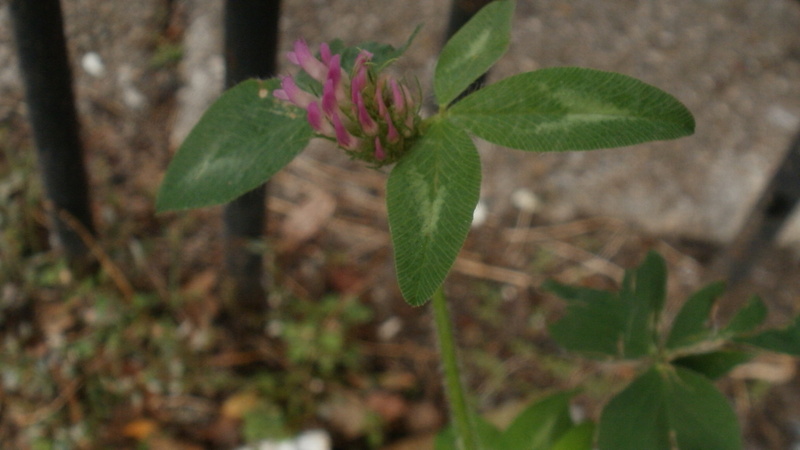 A close relative of White Clover, the Red Clover, Trifolium pretense, remained elusive until late October when I found a single specimen sporting a single pale red blossom within the confines of a Tenth Avenue tree pit. True to its general description, the plant was taller and more upright than a White Clover. Four lucky leaves were not to be found anywhere on the plant, but I did consider myself lucky to have found that one wildflower growing on far edge of the West Village. And with that, my investigation of the clover was complete . . .
. . . Clover and out.